Alex Erro prepares to swing. Erro’s switch to third base has helped the Cats win nine of their last ten games. Arguably the most famous double-play partnership in the history of baseball played over 100 years ago just a few miles from Miller Park. Shortstop Joe Tinker and second baseman Johnny Evers — both Baseball Hall of Famers and Chicago Cubs legends — played 11 seasons together and were so good that in 1910, a poem was scripted about the two of them and first baseman Frank Chance. A century later, senior Jack Dunn and junior Alex Erro may not have been on their way to having an eight-line poem penned about them, but the two were closing in on becoming one of the best up-the-middle tandems in school history. That was until about two-and-a-half weeks ago. For a March 27 midweek contest against Chicago State, coach Spencer Allen made a surprising move. He started Erro at third base and freshman Shawn Goosenberg at second. Since the change, Northwestern has gone on one of its best stretches in recent memory. The Wildcats (15-14, 4-2 Big Ten) head into this weekend’s series against Maryland (16-16, 3-3) having won eight of nine games since that Tuesday victory over the Cougars. Allen said the No. 1 reason for the change was to get Goosenberg in the lineup every day. He also said opening day third baseman Charlie Maxwell had struggled to start the year and he was hoping to get a boost both offensively and defensively. Since the change was first made, Dunn and Goosenberg have played all ten games at shortstop and second base. Erro has started six games at third base and three at designated hitter. Defensively, the trio has made only six errors during that stretch while also making some impressive plays. While Allen said there is going to be some growing pains for Erro at the hot corner, Dunn said Erro has done a good job at his new spot. Senior first baseman Willie Bourbon, who said it’s a “change of pace” to be receiving throws from Erro across the diamond, added that Erro has done a good job showing off his arm at his new spot. The trio has not only done a good job in the field but has been a catalyst for the Cats offense. In all nine games the three have started, Dunn has been the lead-off hitter, Erro followed him and Goosenberg slotted in the three-hole. During this span, Dunn is 16-for-37 at the plate with nine walks and 16 runs scored. Erro is 18-for-42 with 10 RBIs and Goosenberg is 13-for-42 with 11 RBIs. Still, it has not been all smooth sailing for the new infield arraignment. 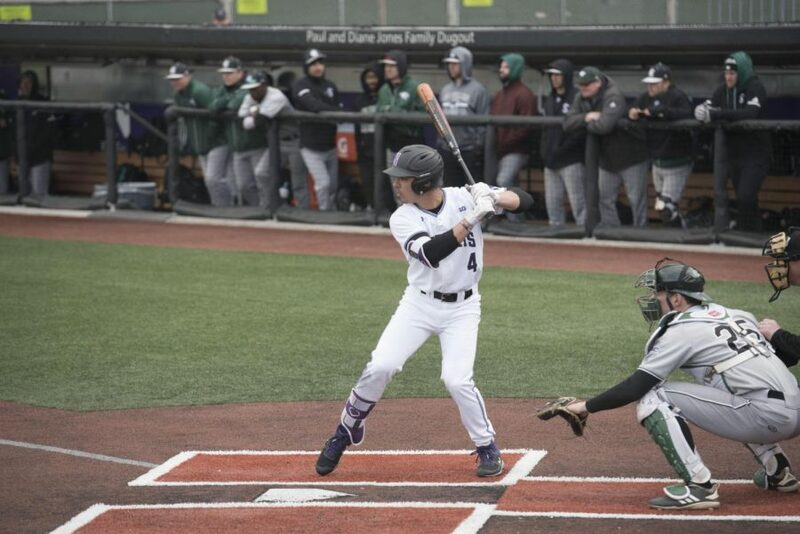 In NU’s one loss during this two-plus week stretch against Illinois-Chicago, Goosenberg committed two errors at second, and both led directly to runs. But his mishaps did not dampen the high-praise his coaches and fellow players continue to give him. Goosenberg said he thought there was a chance he would play at second because of Erro’s defensive versatility and problems he had at third throwing the ball across the diamond due to arm issues. As for Erro, who had never played a position other than second base while clad in purple and white, he said he is fine with the decision.